Farmers are urging Beds Police and Crime Commissioner Olly Martins to make rural policing a higher priority. 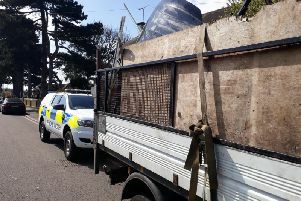 At a meeting organised by the NFU’s Leighton Buzzard branch, members set out their concerns about crimes including diesel theft, fly-tipping and machinery thefts. New NFU Beds chairman Gary Speirs said farmers realised that police budgets were under pressure and shared the frustrations expressed at the shortage of funding available. However, there was real concern that rural crime was on the increase. “This was a useful opportunity to highlight the situation our members are facing and to press the case for higher levels of rural policing,” said Mr Speirs. During the meeting, at Hunter’s Lodge, Whipsnade, Mr Martins was asked about the referendum he has called to coincide with the General Election on May 7. If voters approve, a £24.80 annual rise for the average Band D property will raise an extra £4.5 million which would fund 100 additional police officers, allowing warranted officers to be put back into the Force’s Neighbourhood Policing Teams in each area. He outlined the particular issues that Bedfordshire faces, including organised crime, counter terrorism and burglaries. Mr Martins said: “At the moment Bedfordshire is receiving rural funding but facing urban challenges. The meeting was also attended by Jim Hitch, Community Inspector for Neighbourhood Policing, and Councillor Richard Stay from Central Bedfordshire Borough Council.